The Petosan Toothbrush Twinhead is unique and specially designed by a team of veterinarians and dentists. The Twinhead toothbrush from Petosan is easy to use and does not damage the gums. With this brush you can also clean the inside and outside of the teeth. The dog's mouth does not have to be open all the way in order to brush their teeth. In most cases, you can just lift up the lip to clean all visible areas on the outside of the teeth. The dog will clean the insides of the teeth themselves using their tongues. A number of teeth and molar at the top grind against parts of the teeth and molars at the bottom. The more often you brush, the quicker your dog becomes used to it and the better it is for your pet's teeth. You do not need to brush more than once or twice a week in order to prevent tartar. Toy Dog: for dogs up to 3 kg. Small: for dogs up to 6 kg. Medium: for dogs from 7-15 kg. Large: for dogs over 16 kg. 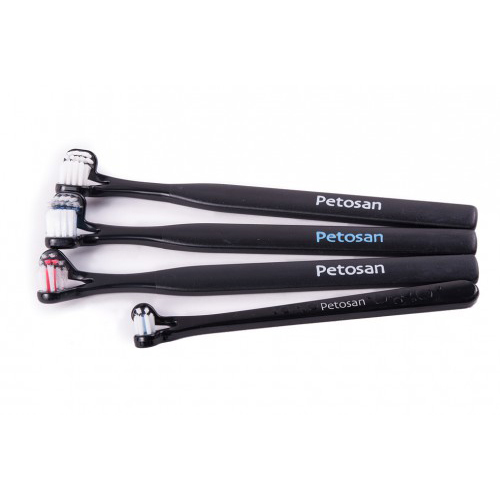 Have you used Petosan Toothbrush Twinhead before? Let us know what you think about this product. Very good very small brush head which I wanted to brush my cat's teeth. Being young when I started he accepts brushing quite well which is an important part of looking after an animal. Brush could be used on small dog also. Bristles perfect not too hard or too soft. Easy to hold. Handle easy to grip.